This climate analysis was conducted as part of the DFID-funded Economics of Climate Change on East Africa project. The Inter-Tropical Convergence Zone (ITCZ) weather system dominates Burundi’s climate. It drives a bi-modal seasonality, with the main rain events occurring March-May and October-November as the ITCZ migrates southward. The influence of ENSO events on Burundi's climate increases the uncertainty in predictions of future climatic patterns, because the ENSO phenomenon is not well represented in most global climate models. Analysis of the average temperature in the region shows a persistent rise of between 0.7 and 0.9°C since 1930 (NAPA, 2007). Results from research using the MAGICC/SCENGEN model suggest that air temperature in the region is likely to increase on average 0.4 °C every 10 years from 2000-2050. If this becomes a reality, by 2050 air temperatures will have warmed by 2.3°C, which will be more significant during the long dry season (May to October). Using CSAG’s Climate Information Portal, which presents statistically downscaled climate projections based on the SRES A2 emissions scenario (IPCC, 2000) at the station level, it is evident that expected temperature increases are significant. Bujumbura’s expected rise in average monthly maximum temperature ranges from 1.7°C to 3.0°C throughout the year by the period 2046 to 2065. Projected changes in average minimum temperature for the same period in the middle of the century are higher but less variable throughout the year, ranging from 1.8°C to 3.0°C. The First National Communication to the UNFCCC and the NAPA reports on the cyclical nature of rainfall in Burundi. Analysis of the historic long-term time series of annual precipitation in Burundi reveals a cyclic character, at intervals of more or less 10 years, with alternating periods of above normal rainfall followed by below normal rainfall. The mean annual rainfall over Burundi ranges from 1940mm in the Congo/Nile crest highlands to 864mm in the western lowlands (calculated over the years 1960 to 1990). This indicates the spatial variability across the country in what constitutes 'normal' rainfall conditions. Projections of monthly precipitation level varies somewhat. The months of January, May and July are all expected to get wetter than the baseline conditions. Extreme rainfall events are shown to be on the increase for the months from December through to March. Between the years 1999 and 2006 the records indicate a shortening of the rainy season in the North-Eastern regions of the country, but with seasonally torrential rains coupled with thunders and lightning, and an extension of the dry season. 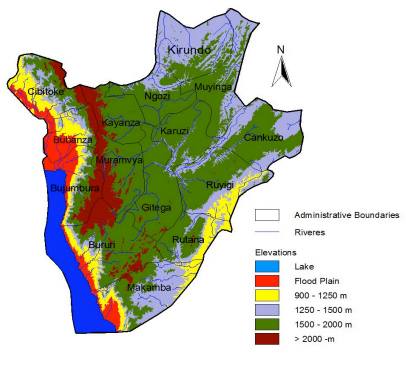 Since 1999 there has been increased variability in the timing of the rainfall in the lower altitude areas, for example Kumoso, Bugesera and Imbo, with the dry season getting longer from May to October (6 months), the wet season contracting and with an overall drying trend in the annual figures. A food crisis in 2004 and 2005 caused by recurrent late and poor rains and an outbreak of African cassava mosaic virus was further compounded by floods that occurred during the vegetative period for crops and a few days before bean harvests nationwide. In the region of Bugesera, since 1999 there has been very late onset of the rains resulting in the loss of harvests, famine, loss of human lives, displacement of population, etc. All the Northern lakes saw their level decreased by more than 400m. In the communes of Bugesera (Busoni and Bugabira in Kirundo Province and Giteranyi in Muyinga Province) there is a drying trend which is causing desertification.